Double-barrelled surnames, usually created following a marriage between two families, have no overall meaning as a unit, but the separate parts have their own meaning and derivation. 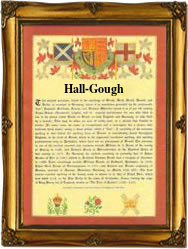 In this instance, the name Hall is of Anglo-Saxon origin, deriving from the Olde English pre 7th Century "heall", hall, residence, manor-house, and originally given either as a topographical name to someone who lived near a large house, or as an occupational name to one employed at a hall or manor. Hall may also be locational in rigin, from any of the various places thus called in the north of England, Wales, and in Scotland, for example, Hall in Lancashire, Carmarthenshire and Roxburghshire. Early examples of the surname include: Robert de la Hall (Hampshire, 1199), and William de Hall (Irvine, 1426). John Hall (born 1584), who emigrated to New England from Kent in 1632, founded a notable American family, whose members have included Lyman Hall (1724 1790), one of the signatories of the Declaration of Independence. The surname Gough has two distinct possible sources. Firstly, it may be of Celtic origin, and an occupational name for a smith, from the Gaelic "gobha", Cornish/Breton "goff". The surname is widespread in East Anglia, where it is probably of Breton origin, introduced by followers of William the Conqueror. Gough may also have originated as a nickname for a red-haired person, from the Welsh "coch", red. On February 1st 1549 Elizabeth Gough and Rychard Walker were married at St. Michael's, Bassishaw, London. The first recorded spelling of the family name is shown to be that of Warin de Halla, which was dated 1178, in the "Pipe Rolls of Essex", during the reign of King Henry 11, known as "The Builder of Churches", 1154 - 1189. Surnames became necessary when governments introduced personal taxation. In England this was known as Poll Tax. Throughout the centuries, surnames in every country have continued to "develop" often leading to astonishing variants of the original spelling.